Whether looking back at Hercules Massis, reporting the night terrors of Shop-Vac man, or entering the imaginary world of a young boy and his pet fish, these 33 stories conjure vivid worlds in a matter of sentences. BITE: An Anthology of Flash Fiction zeroes in on the intimate, often overlooked moments of life that have the power to transform the ordinary into the extraordinary. In these very brief stories, emerging authors such as Lesley Alicia Tye, and established masters of the form like Tom Hazuka, demonstrate that the truth of our lives lies in the details. Authors include: Sherrie Flick, Bruce Holland Rogers, Alex Mindt, Tara L. Masih, and more. Available for $12.95 (c) Trachodon Publishing LLC, 2012. ISBN 0615721893. Have a Bite. Purchase Here. 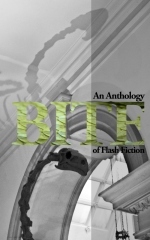 When I first pulled Flash Fiction: 72 Very Short Stories edited by Tom Hazuka, Denise Thomas, and James Thomas off the shelf in my father’s library, and read the opening story, I knew immediately I could no longer be the same writer. That anthology, along with many other flash collections published since, simultaneously baffled and inspired me: How could these writers do so much with so little? Years later, reading an anthology introduction written by Charles Baxter, I found an answer. Baxter explained that a novel can win readers over by points, but flash fiction has to win by TKO. Technical Knock Out—that’s what the best flash fiction does, marking a moment in the story with such vivid texture, the reader has no choice but to feel it right between the eyes. Over time, my own style as a flash writer and editor has become refined. I’m a sucker for image-based metaphor and, perhaps against better judgment, I also love stacked adjectives. That said, knowing when to let a sentence run on, and when to cut something short, are also crucial to writing flash. A writer who employs a precise verb to conjure place, emotion, and action with a single word is a writer who understands about economy of language and allegiance to story. It’s also a writer I’d include in an anthology such as this one, which is part of what I looked for when compiling flash fiction from Cheek Teeth to create BITE. The worlds evoked in these very brief stories find their power in the details of life, not the tropes of high drama or violence. They rely on carefully crafted language and exact imagination. At just the right moment, they not only hit me between the eyes, but also in the heart.